Bayan Audio Soundbook Go review | What Hi-Fi? Bayan has opted for a sloping rectangle with just enough tilt to fire music up and towards the listener. 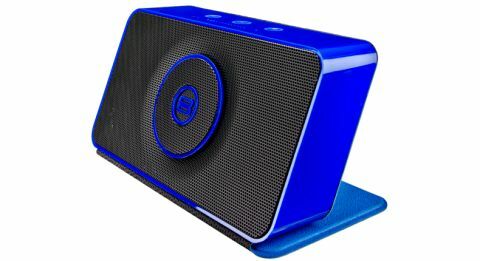 Available in three different colours (blue, red or white), each speaker comes with its own Apple-esque magnetic cover. It lies across and protects the speaker when not in use, and provides a firm base when flipped underneath. The colourful glossy finish stands out, but there’s a price to pay: it easily shows up greasy paw prints and it didn’t take long for our review sample to become a bit grubby. In terms of features the Bayan is fairly competitive against the rest of the pack: there’s an integrated mic, a 3.5mm auxiliary input for connecting alternative sources, and near-field communication (NFC) pairing. But there’s no battery indicator – Bayan claims it lasts seven hours, so the built-in battery falls short of the Pure Voca and Roberts Travel Pad. It’s sound quality that is crucial for this type of kit, of course, and the Bayan’s overall balance is nicely judged. Highs don’t jar as especially harsh or uncomfortable, and there’s decent weight to low-frequency rumblings without things sounding thick or woolly. Play OK Go’s Here It Goes Again and the snappy mids are nicely taut and firm. Where the Soundbook Go falls down is when it comes to musicality. Tracks don’t sing with enough rhythm. The Bayan doesn’t communicate the swing and enthusiasm of Sam and Dave’s Soul Man, and it struggles to accommodate the more subtle dynamic demands of Stephen Fretwell’s Run. A speaker such as the Philips BT3500B has a better grasp of the music and shows greater versatility across the range. The Bayan Audio Soundbook Go puts in a decent shift, but you couldn’t place it among the top Bluetooth speaker performers. Class leaders at this level deliver superior sound quality and features, so we’d advise you to compare this with a few other rivals before you buy.